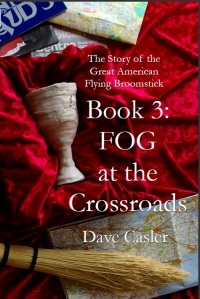 The third book in the American Flying Broomstick Series, FOG at the Crossroads, will be available within days. At last! It’s here! The third book in the series, The Story of the Great American Flying Broomstick, Book 3: FOG at the Crossroads, is just about here. I received the proof from the printer last week. Everything is as it should be. And the print run should be here this week or next. As soon as it is, I’ll put a “Buy Now” button in the catalog. So watch this space for availability! The official launch will be at the Regional Mensa Convention in Reno, NV, in early October, but unofficial availability starts as soon as I receive the print run.